BooksDuhl, Leonard J. 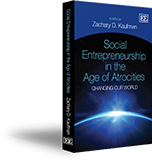 (1990), The Social Entrepreneurship of Change, New York, NY: Pace University Press. BooksDurieux, Mark B. and Robert A. Stebbins (2010), Social Entrepreneurship for Dummies, Hoboken, NJ: Wiley Publishing, Inc.